On line 6 I wanted a bit mask to represent the status of the switches. When I setup things originally I was not sure how many bits I was going to support and I wanted to be able to change the length of the bit mask with just one #define. Given that my switch matrix component can do 8 rows and 8 columns a.k.a. 64 switches I probably should have set this mask to uint64_t. BUT when I started the work I didnt know that type existed so I just used uint32_t. It is even a bit more confusing because Cypress provides the non CMSIS-CORE definition of uint8, uint16, uint32… All that aside, if you change the #define it will change for all of the switches. On lines 8-13 I define a new type that defines the list of possible interrupts (No interrupt, rising edge, falling edge or both edges). Line 15 defines the start interface. 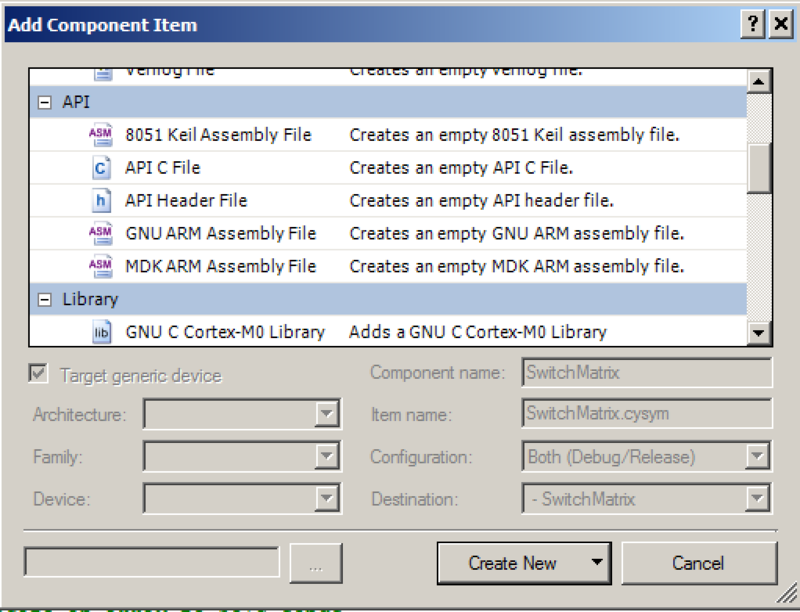 This component uses the systick timer to run the state machine that sequences turning on/off of the switch rows/columns. The “number” is which of the 4 Cypress SysTick interrupt vectors to use. Line 16 returns the status of switch at row,column and returns 1 for active and 0 for inactive. Line 18-21 defines the interrupt based interface to the switch matrix. The big question with the interrupt interface is: What function is called when an interrupt happens? The answer is: I used the “cyapicallbacks.h” functionality that PSoC Creator provides for you (more to follow). The next thing that you need to do is to implement the actual firmware for the system. 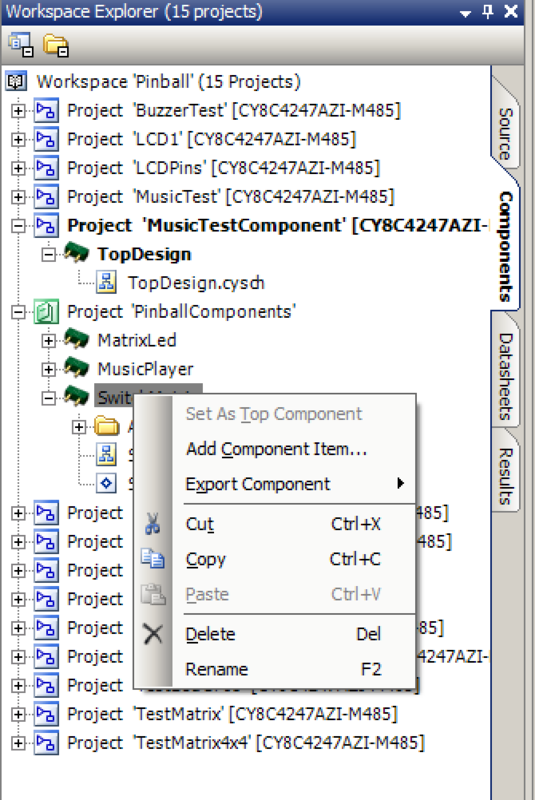 Start by adding “SwitchMatrix.c” to the component (using the same method detailed above except choose “API C File”. 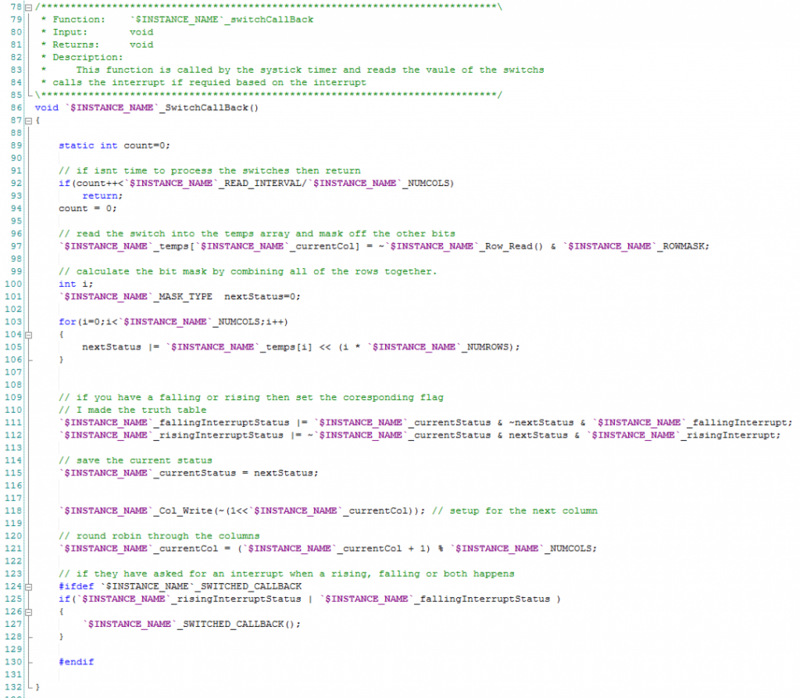 On lines 4-9 I turn Symbol Parameters into #defines which can be used in my source code. Remember that we let the user define the $NumCols, $NumRows and $RefreshInterval. Line 10 is a neat way to make a bit mask of all 1’s up to a bit position. e.g if you want 3’s aka 0b111 then you can do 2^3-1 = 7 = 0b111. This bit mask is used to mask off the read bits from the pins. Line 14 defines a variable which is the Current Column that you are looking at. This changes every READ_INTERVAL/# of column ms and cycles through the columns. Line 16 is an array of the bit masks of the status of each of the columns. Line 17 holds flags for which rising and falling switches you are interested in for an interrupt. Line 24-25 holds the status of which of the switches caused the interrupt. The SetInterruptMode function sets the bit mask for the rising or falling interrupt. 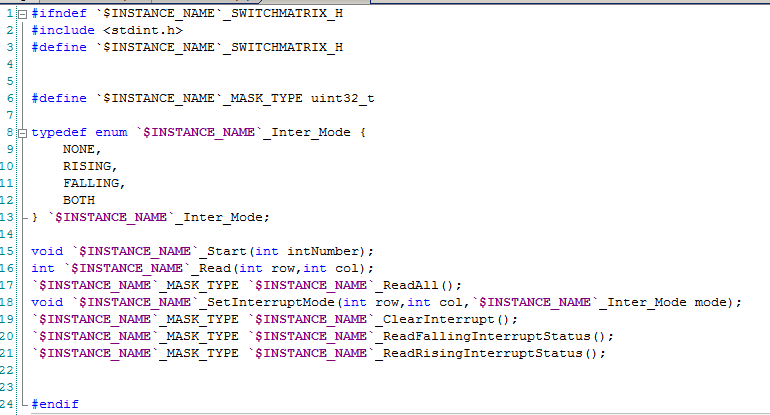 The $INSTANCE_NAME_MASK_TYPE is the type (in this case uint32_t) of the bit mask for switches. On line 41-42 I turn off the interrupt. Then the switch on line 44 resets the bit based on the input. 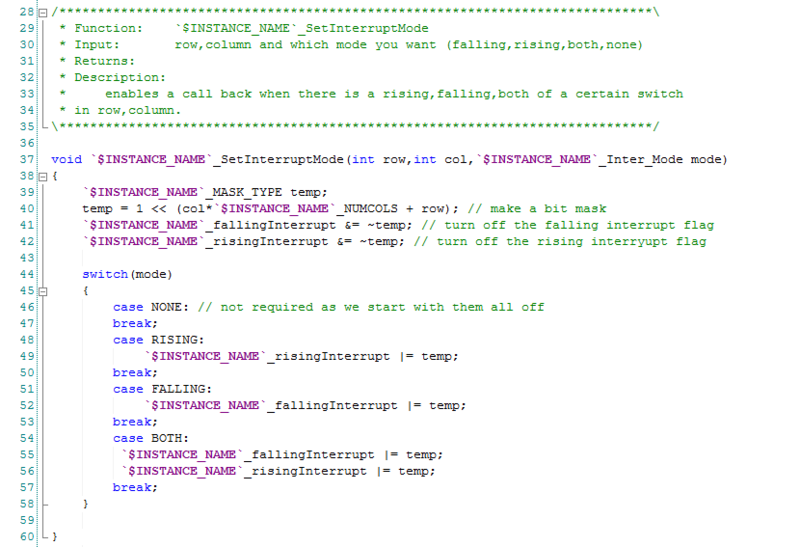 The ClearInterrupt function just clears all of the interrupt flags (rising and falling). It returns the state of the flags (before the reset). 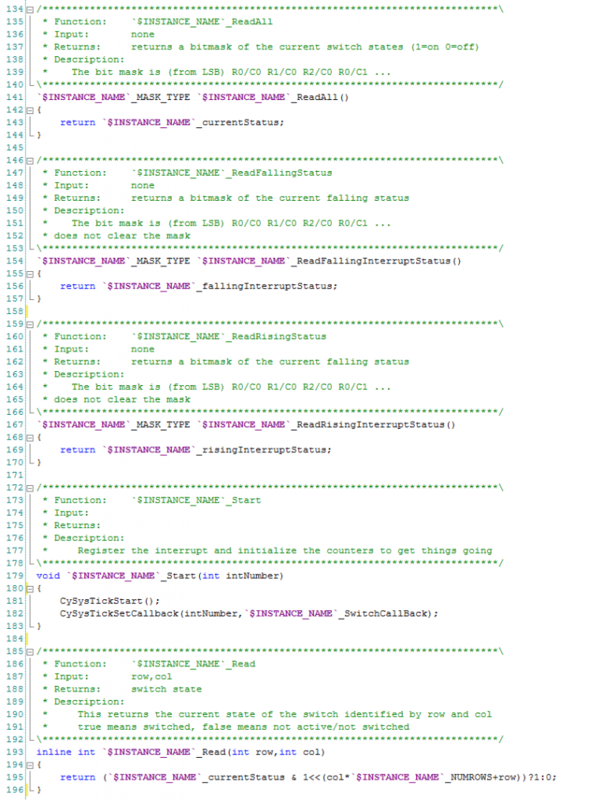 The function “SwitchCallBack” (which should have been defined static) is the main brains of switch sequencer. It is called every 1 ms by the SysTick callback. Lines 92-94 lowers the frequency of doing something by only updating the status etc every “READ_INTERVAL/Column” ms.
Line 97 reads the digital input pins of the switch matrix. It uses the row_mask to mask off the bits that are not being used. It turns out that this was not needed because when you read a bus of pins the Cypress APIs automatically mask off the other bits. Lines 100-105 builds a bit mask of the status of all of the bits. Line 118 moves turns on the next column pins. Line 124: Calls back if there is an interrupt. It uses the “cyapicallbacks.h” to figure out what to call back. This could have been done by registering a function pointer… but oh well that is what Cypress decided. 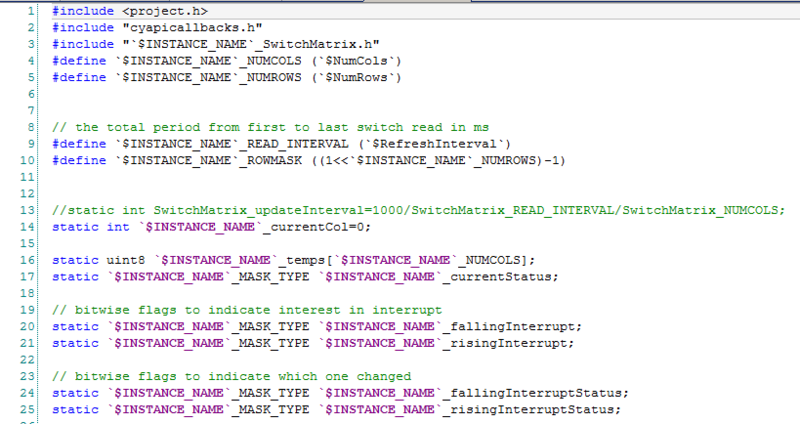 To use this you do a #define MatrixSwitch_SWITCHED_CALLBACK with the name of the function you want called. The next functions are just simple helper functions which return a status or start the component. In the next post I will show you some simple firmware to test the component.